Seyyed Ali Reza Avayi, Minister of Justice of Iran appears on screen as he attends the Human Rights Council at the United Nations in Geneva, Switzerland, February 27, 2018. Demonstrators gathered outside the UN in Geneva and some diplomats left in protest over an address given by Iran's justice minister, who has been sanctioned by the EU over human rights violations. Alireza Avayi took the podium at the United Nations Human Rights Council late on February 27, slamming what he called "appalling deficiencies" at the UN and accusing Western powers of "exploiting human rights for their political ends." 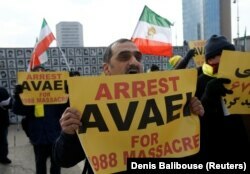 His presence spurred a protest outside the gates of the UN's European headquarters, with between 100 and 150 protesters waving flags used by exiled Iranian opposition groups and signs reading "Arrest Avayi." The demonstration featured a large pyramid of shoes meant to represent the thousands killed in a 1988 massacre of political prisoners allegedly overseen by Avayi. Avayi is perhaps the most controversial of the around 100 dignitaries addressing the opening of the rights council's annual session this week. Brussels has slapped sanctions on him, maintaining that as Tehran's former top prosecutor, he was "responsible for human rights violations, arbitrary arrests, denials of prisoners' rights. and an increase in executions." Before Avayi took the floor, a handful of diplomats left the room to protest his presence. When approached by journalists after his speech and asked about the criticism, Avayi walked by without responding. Earlier this week, Washington's UN ambassador, Nikki Haley, slammed the rights council for allowing him to participate and accused Avayi of "some of the worst human rights violations in Iran." The council "should be ashamed," she said. "Yet again, the council discredits itself by allowing serial human rights abusers to hijack its work and make a mockery of its mandate to promote universal human rights." "This does nothing but reinforce the United States' call for much needed reforms at the council for it to be viewed as a good investment of our time and money," Haley said. The U.S. delegation to the council said Avayi "oversaw the summary executions of Iranians" in the late 1980s while today, he presides over "arbitrary" arrests and imprisonment "in a network of facilities notorious for suspicious deaths, the use of torture, and denial of medical care." In his speech, Avayi criticized a blockade of Yemen by a U.S.-backed Arab coalition waging what he called a "war of aggression" against Huthi rebels there. The UN estimates more than 10,000 people have died in the conflict. "These self-proclaimed champions of human rights, through finger-pointing, unjustly and widely blame others for violation of human rights, while certain parts of their population, especially blacks, immigrants, foreigners, and indigenous people, grievously suffer from human rights violations under their watch," Aviyi said. Addressing a principal criticism of Iran today, Aviyi told the council he expected to see fewer executions in Iran as a result of recent reforms in drug laws. Drug violations have accounted for a large share of Iranian executions in the past. On February 26, a Swiss lawyer filed a complaint on behalf of the National Council of Resistance of Iran asking the Swiss attorney general to prosecute Avayi for crimes against humanity. The attorney general's office did not say whether it would press charges. European Union sanctions bar Avayi from traveling to the EU and freeze any assets he might hold in the bloc. Swiss authorities have also imposed sanctions on Avayi, but they are financial and do not prevent him from visiting the country. Avayi is not on the UN Security Council's sanctions list.